A 99233 CPT code explanation, 99223 examples, 99233 example note, 99233 RVU amount, 99233 wRVU / work RVU amount and a 99233 template for EMR. What is CPT Code 99233? CPT code 99233 is assigned to a level 3 hospital subsequent care (follow up) note. 99233 is the highest level of non-critical care daily progress note. When it comes to 99233 documentation is critical, however understanding of the documentation required is even more critical. WorK RVU (wRVU) for cpt code 99233 is of course higher than that for 99232. How many work RVU (wRVU) are given for a 99233? A 99233 CPT code is associated with 2.0 work RVU’s also known as wRVU. In general when is a 99223 code appropriate? When it comes to coding, documentation is key and you would be surprised to see just how little writing is required to ensure all the key criteria. My personal rule however is that common sense should prevail as opposed to trying to game a system with documentation. If a patient is improving or remains stable CPT code 99233 is probably not appropriate. Many times, rounds are made on patients where it is essentially a continue meds, continue monitoring, improving basis, essentially a courtesy visit. These are not meant to be 99233’s. Often, for example the day after a patient is admitted, many management decisions continue to evolve and treatment changes are made. For example blood pressure control or heart failure would require specific medication adjustment and tests that need to be reviewed. Development of renal failure for example that would require holding meds, getting tests, following them and potentially arranging consultation and discussing with specialists. This would be a classic 99233 CPT code type situation. In general, as the patient improves to a state where they are improved and awaiting final stabilization for discharge, CPT code 99232 rather than 99233 would be appropriate. Admission – Patient with shortness of breath and chest pain, comorbidities present, diagnosed with congestive heart failure and known ischemic cardiomyopathy treated medically, IV meds given, complexity is high. Day 2 – Patient improved, meds changed to PO, home meds restarted, no invasive tests planned, continuing to monitor. Day 3 – Kidney function worsens, meds held and changed appropriately, concern for cardiac output being low, nephrology consulted, situation worsened from prior day. Day 4 – Echo reviewed, cardiac function worse than thought, thinking about right heart cath, dobutamine started on floor, IV diuresis ongoing, discussed with consultants. Day 4 – Situation improves, renal function stabilizes with inotropic support and renal recommendations, breathing improved, meds regimen stable, labs and CXR stable, patient likely to be discharged in next few days. Since 99233 is higher levels of billing when it comes to inpatient follow up, it is likely to come under more scrutiny and therefore documentation and understanding of requirements is critical. In general, many inpatients are truly sick and if there is genuinely high complexity in terms of the patient and the situation the documentation will take care of it by itself. When we take a deeper dive in to the guidelines for documentation it becomes ridiculously convoluted and takes an investment of time to truly develop an understanding to where it can be applied. Once that understanding is developed the whole thing becomes much easier. Unfortunately a note becomes like a point system where a certain number of points are required for a certain number of categories. That can be advantageous however when it comes to efficiency in documentation for those that understand how it works. To bill a 99233 you need at least 2 of the 3 key components. Alternatively a 99233 can be billed on the basis of time as described below. The 99233 represent what would typically be 35 minutes of care at the patient bedside or on the patient’s floor or unit. If 35 minutes was spent with a patient, if there is specific documentation, it is felt that the time alone may justify the 99233. That documentation must include 1) Total time spent (>35mins) 2) Description of the counseling and care coordination 3) State that over half the time was spent on counseling and coordinating specifics of care. Chest pain (1) exacerbated last night, left chest (2), radiates to neck (3), sharp (4) and intermittent in nature (5), associated shortness of breath (6). Shortness of breath (1) noted last night, intermittent (2) and occurring at rest, no relation to exertion (3), no chest pain (4), no nausea (5) or diaphoresis (6). 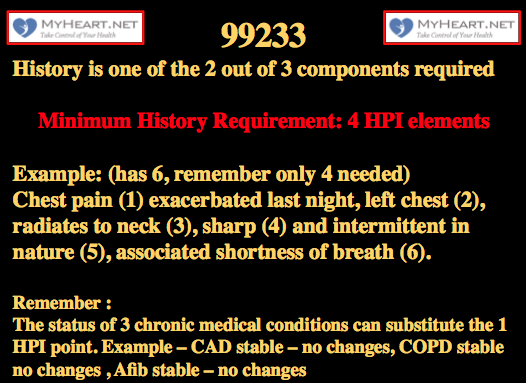 These examples contain more than the 4 elements required for the HPI element of the 99233. If a patient has a worsening of a condition and it is described appropriately then this should be easily fulfilled. Note that if there isn’t a 4 point interval HPI, documentation of the status of 3 chronic medical conditions and 2 review of systems are reportedly acceptable surrogates for this in a 99233. 1 point each for Neck / lung / heart / carotids / abdomen / liver / edema / digits / skin / mental status / neuro etc. In general I would say include 6 organ systems regardless. In this cardiac strong exam we have 9 different ‘systems’ which fulfills the 6 suggested, we have 15 bullets, this exceeds the required 12. 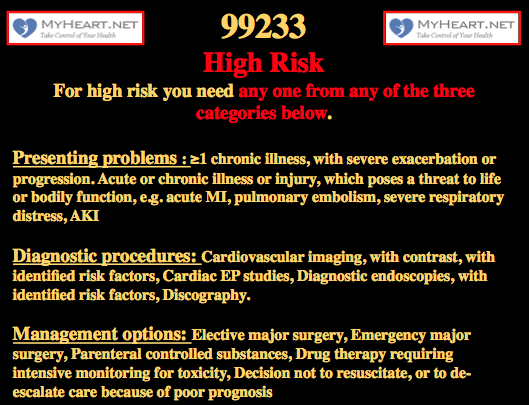 For a 99233 typically a combination (2 out of 3 needed) of 4 problem points, 4 data points, and documentation of high risk. Here is a comprehensive template for a 99233. I’m sure people will argue that its overkill and takes a lot of time, however I disagree. If these elements are reviewed it clearly improves patient care as multiple pertinent and often ignored elements will be reviewed and taken in to account and can influence decision making. The documentation is comprehensive and in reality not overly time consuming in the era of EMR, particularly if auto-population is used and you are familiar with the patient. If a significant portion of these elements is followed you will much more than fulfill the documentation criteria for a 99233. For those learning the specifics of documentation I would suggest starting comprehensive like this then when you feel comfortable the note can be trimmed significantly and tailored to needs. Shortness of breath worsened overnight, caused to wake from sleep, worse with exertion and lying flat, no further chest pain, no nausea or diaphoresis. Atrial fibrillation – rate controlled, continue beta blocker, continue Coumadin for anticoagulation, INR is 1.8 aiming for 2.0-2.5. Will discuss with pharmacy. Detailed Breakdown of the 99233 note template and example. The example above is a relatively extensive documentation, it would take some people a long time to do that and others could run through it relatively quickly. In my opinion, if there is truly a higher level of care such as a 99233, the time and documentation should reflect that. It can, if methodically done, be in an efficient manner. By no means is all the documentation above needed. The note basically scores top points in every requirement, and remember only 2 out of the 3 are needed. This has already hit over the 4 points required. Theoretically only 1 of the other 2 categories (physical exam and complex decision making) is now needed. Note that if there isn’t a 4 point interval HPI, documentation of the status of 3 chronic medical conditions and 2 review of systems are acceptable surrogates. The review of the labs contribute a point to the data point section of the medical decision making section. Remember, 4 data points are needed. Also the increase in creatinine supports the AKI as a new critical diagnosis, the BNP supports CHF acute exacerbation and the hypoxemia supports respiratory distress. Remember, a new significant problem with additional work up planned fulfills 4 points and already qualifies for high risk. Personally reviewing the radiology test CXR is 2 point. Independent review of the EKG is 2 points (If we had decided to review old records and summarized that would have been 2 points). Later we order an echo, that’s a further point. We had already reviewed the lab above, that’s a further point. 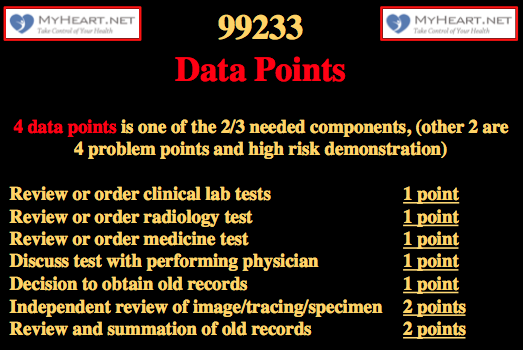 In total here we have 6 data points that exceeds the 4 data points required for the 99233. That’s already one of the 2 requirements of the complex medical decision making out the way. 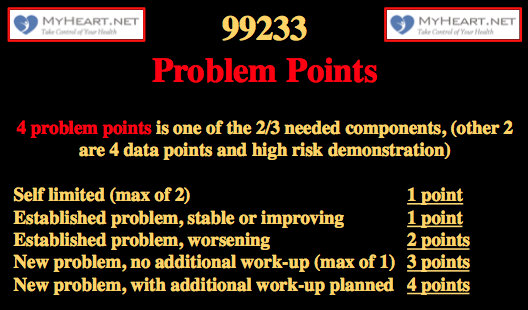 Remember it has to be 2 out of the 3 of 4 problem points, 4 data points and high risk. We already have evidence for the new significant diagnosis / problem point above so in theory this note already qualifies for a 99233. Remember that a total of 12 bullets are needed. Ideally 6 organ systems at least. Can be 12 bullets from at least 2 technically. 3 vital signs are 1 point and general appearance is 1 point. In the exam above we have a total of 14 points, we have 6 organ systems, it easily fulfills requirements. These 4 stable points are ok as they are issues that significantly impact treatment. AKI on likely CKD (new problem, significantly threatening issues, further work up planned (4 points). Once again, our documentation here is basically worth 12 problem points, remember we only need 4; the acute CHF or the AKI would alone have been enough to suffice. In the section above we have simply bolstered our documentation above. We have laid out the problems that are new and significantly threatening and demonstrated the further work up planned. We have reported the management of the chronic issues. We have documented tests planned and discussions had. The discussion with the other physicians involved and also the discussion with the family is a supporting factor for complexity. The review of the medical and the PT notes can act as a point in data. The old echo review can act as a point in data. The ordering of the new echo acts as a data point also. If this had been a CT angiogram, cath, or other contrasted cardiac scan, or endoscopy for example, it would have actually fulfilled the entire criteria for high risk. If there was IV parenteral therapy, i.e IV pain meds that are controlled, then that also would have acted as high risk. The INR monitoring for the Coumadin, given its significantly high risk for toxicity and need for monitoring can act as a high risk feature also. I’m not a fan of minimalist notes, I think it can breed complacency and doesn’t help with the thought process. The following shows however that when sticking to the criteria for a 99233 we can still achieve what we need to with a minimal note. Shortness of breath worsened overnight, PND, worse with exertion and lying flat, no chest pain, nausea or diaphoresis. 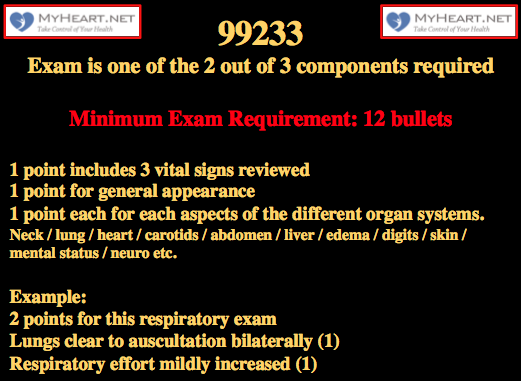 Theoretically we could stop here, we have 2 of the 3 main sections with all criteria fulfilled, interval HPI has 4 points and the physical exam has 12 bullets with 6 systems. This highlights how knowledge of what’s required can allow focus on main issues if that is the aim. In reality the note will continue thought. Both of the above are 4 points each, just one of them would suffice for the medical decision making high complexity requirement. The INR and Coumadin and need for monitoring demonstrate a high risk. In theory this is all that’s needed, you could even take out the physical exam section and still have fulfilled 2/3 requirements as needed. This note was very short, but still way over the requirement in terms of points needed, essentially its point system dense and easily fulfills the documentation needs for a 99233. 4 data points already and high risk demonstration, theoretically the note can stop here and the 99233 criteria have been fulfilled, we have 2 out of the 3 needed, we skipped the exam here remember. This note was very very short, but still met the requirement in terms of points needed, essentially its highly point system based and despite the brevity of the note fulfills the documentation needs for a 99233.